Land titles serve as one strong proof that you are the owner of the land, the one who pays for the taxes, and the one maintaining it. Have you ever thought that you would somehow misplace or lose, or even damage your land titles? Because yeah, it’s just a piece of paper you can place at any location; it can be easily be misplaced or damaged because it is not that thick of a sheet. However, there are ways wherein you can replace or reconstitute lost and destroyed land titles. Why you should protect and take care of your land titles. Before getting deep into how you can replace or reconstitute your lost or destroyed land titles, do you ever wonder why you are obliged to take good care of it? You evidently need your land title if you plan on selling it or passing the ownership to someone else. So if you think that this piece of paper is not that significant, you better think again because it can cause you your property. When properties are mortgaged, the original owner’s copy of the land title is kept safe somewhere; free from flood, fires, and destruction than can lose or damage the title. However if a property is fully-paid, the payer should have knowledge on where the original land title is located. How can you keep it safe? Ensure that the land title is somewhere where water can’t reach it, where fire can’t eat it, and where robbers can’t find it; assure yourself that it is kept in a very confidential place in order to assert its security. You can also make it digital. You can protect your physical land title by converting it to eTitle through the Land Registration Authority’s Voluntary Standardization Program. You can have it inside a safety deposit box (SDP) that is not too far away from your home. With this, you will have the assurance of it getting dry and complete even if a calamity trenches your home. Choose a bank that is high enough to be extra safe. This is the flowchart of the reconstitution of land titles because there were cases where land titles were lost due to natural calamities such as floods, fires, etc. 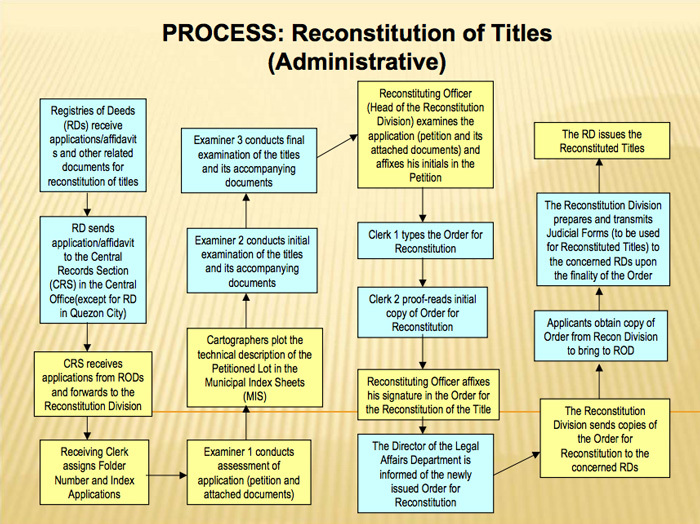 There are cases where the titles in the Registry of Deeds got lost or destroyed but there were no administrative reconstitution was determined to be inexorable, they need to undergo judicial reconstitution. Yes, reconstitution of a title requires a bit of hard work and patience; it also needs a lot of time. The process could take months before it is fully complete, sometimes even years. What you need to prepare are legal documents, affixed certifications and clearances, and you need a good counsel to represent you in court hearings and proceedings. 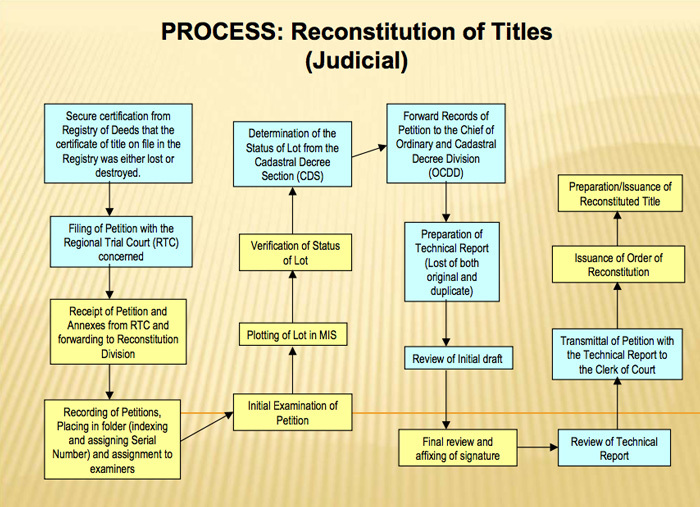 This is a flowchart of judicial reconstitution, from ombudsman website. If anyhow what you lost is the duplicate of the original owner’s land title, do not panic because it is not the end of the world. The original title might be in the Registry of Deeds or maybe it’s with the owner himself. Section 109 of PD 1529 discusses the procedure in getting a new duplicate of the original document. Section 109. Notice and replacement of lost duplicate certificate. In case of loss or theft of an owner’s duplicate certificate of title, due notice under oath shall be sent by the owner or by someone in his behalf to the Register of Deeds of the province or city where the land lies as soon as the loss or theft is discovered. If a duplicate certificate is lost or destroyed, or cannot be produced by a person applying for the entry of a new certificate to him or for the registration of any instrument, a sworn statement of the fact of such loss or destruction may be filed by the registered owner or other person in interest and registered. This is how you reconstitute or replace a lost or damaged land title (Original and duplicate.) Of course, it is better to just prevent a negative outcome from happening rather than curing it. Follow the guidelines I’ve stated above to ensure the completeness of your land title.